1. Prepare the cake pans by greasing them and lining the bottoms (not the sides) with wax paper. 2. Prepare brownie mix according to the package directions. Divide batter between the two prepared cake pans. 3. Bake according to the package directions. Remove and cool completely. 4. Run a small paring knife around the edges of each brownie, loosening it from the pan. 5. Invert one layer onto a cookie sheet, and spread vanilla ice cream on top, coming right to the edge (you can slightly soften the ice cream first). 6. Place the other brownie layer on top, and press gently to secure. Place in the freezer until firm, about 2 hours. 7. 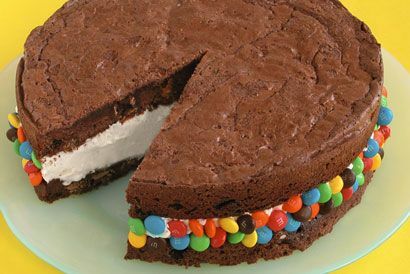 Just before serving, press M&M’S® Brand Chocolate Candies into the ice cream. 8. Cut into thin wedges and serve right away.